People value an efficient resolution to their issue and most dislike being kept on hold when calling a business. Reducing hold times, using digital channels, and seeking outside resources like virtual assistants help optimize a business’ telephone customer service. With the rise of texting and online communication such as chatbots, it may feel like people don’t use their phones to actually make calls anymore. Yet, data shows that people most frequently use their smartphones to make calls. Communication by phone isn’t going away, and your businesses needs to know how to provide effective and efficient telephone customer service. Clutch surveyed 501 people who called a business more than three times in the past six months to learn what they expect from telephone customer service. The data shows that consumers value efficient service and knowledgeable staff when they call a business. They find being kept on hold, rude service, and automated phone menus frustrating. Businesses can use this data to improve their phone-based customer service, including how to train their employees and which resources to hire, such as answering services or a virtual assistant. Nearly 8 in 10 people rank an “efficient resolution to their issue” among the top three traits they value when calling a business, followed by knowledgeable staff (75%) and clear communication (65%). 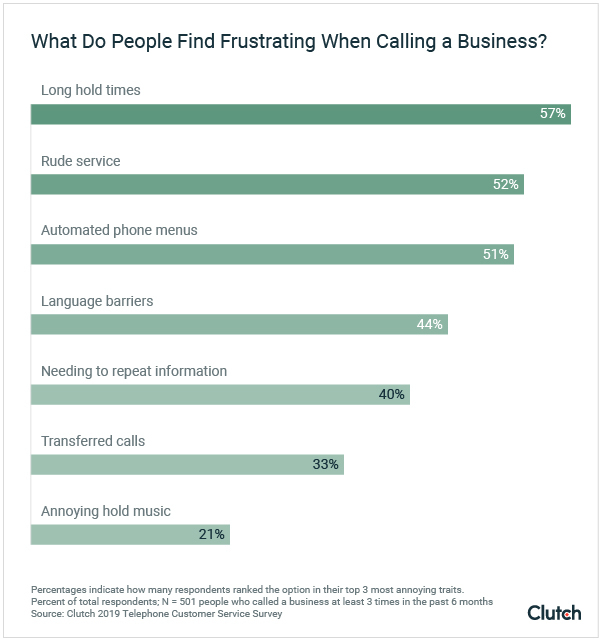 Most people rank being kept on hold (57%) in their top three issues when calling a business, followed by rude service (52%) and automated phone menus (51%). 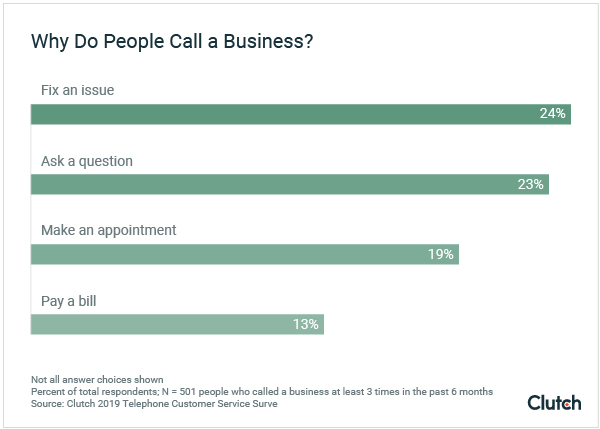 Fixing an issue (24%), asking a question (23%), and making an appointment (19%) are the most common reasons people called a business in the past six months. People are almost as likely to share a positive customer service experience online (74%) as a negative one (70%). When customers call a business, they expect their issues to be fixed or their questions to be answered quickly. 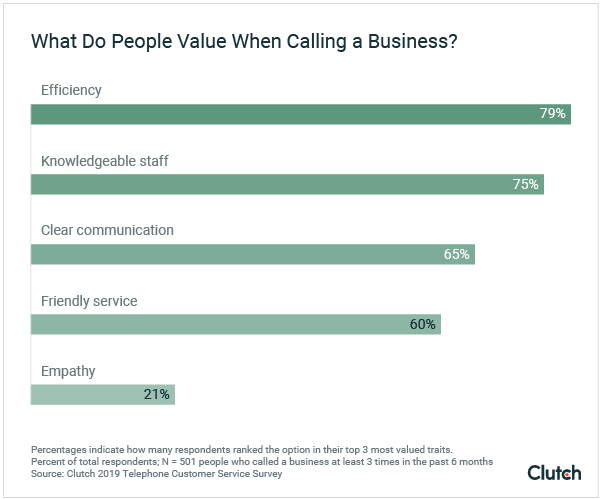 Nearly 80% of people rank an efficient resolution to their issue as one of the top three traits they value the most in a company's telephone customer service. The next two most valued traits are a knowledgeable staff (75%) and clear communication (65%). First, a business can adjust customers’ expectations of efficiency by under promising and over delivering. This age-old advice applies to most methods of customer communication, including phone-based customer support. For example, consider a customer calling a business asking for a price estimate. If the business promises them a rate within 30 minutes, but doesn't deliver for an hour, the customer will view the business negatively. But if the business promises them a rate in 2 hours, and delivers in 1 hour, then it will leave a positive and more efficient impression. A business may try to compete by marketing quicker service times, but the business will only harm its brand if it can’t actually deliver within the promised timeline. A business can answer some requests and questions quicker and more thoroughly using digital channels, such as chatbots powered by artificial intelligence. I want to check my bank balance. I want to check if I made a payment. “You don’t need to talk to a human to answer those questions and often, it’s more efficient to do so with a digital format,” Hyken said. Routing simple inquiries to digital, automated channels frees up resources to answer complex inquiries more efficiently over the phone. Customers will have different standards of how long they will patiently wait for an answer from a business depending on the communication channel. For example, 42% of consumers expect a response from a business on social media within one hour. Meanwhile, customers are only willing to wait 2 minutes or less on the phone with a business before hanging up. If you are using resources so each communication channel has the same wait time, you may be using those resources inefficiently. Instead of a 10-minute wait for customer service on both social media and the phone, for example, a business will leave a better impression if there’s only a 5-minute hold on the phone and a 15-minute wait on social media. Customers want efficient telephone customer service. A business should consider how it will set customers’ expectations and manage different communication channels. Since customers’ prioritize efficiency when calling a business, it makes sense that they rank being kept on hold as the most frustrating issue of telephone customer service. More than half of people (57%) rank being kept on hold as one of their top three most frustrating experiences with telephone customer service, followed by rude service (52%) and automated phone menus (51%). To reduce phone wait times, conduct data analysis on customer service telephone calls to understand your business' strengths and weaknesses. Time on Hold: Your business will only know if there's an issue with hold times by monitoring this metric. Time of Calls: Does your business receive more calls at a particular time of day or on the weekend? Types of Questions: What questions do customers most commonly ask? Does one department of your business need significantly more resources for answering calls than others? Nathan Strum is CEO of Abby Connect, a virtual receptionist and telephone answering service provider. He explained the importance of data when it comes to understanding the resources a business needs to answer the phone efficiently. “If [a business] can find a way to determine how long their customers are kept on hold and at what times, they might have a better understanding of how to staff or when to use an alternative service for the overflow,” said Strum. If it seems like your business cannot keep up with customer communication without long hold times, your business may want to invest in answering services or virtual assistant services to alleviate the burden on staff. Businesses must consider how they can reduce hold times to maintain customer satisfaction, including simple steps like calling customers back. People hate waiting with a phone pressed to their ear, not sure when a business will finally pick up. Customers may feel like they can’t accomplish other tasks while waiting on hold, and their frustration increases the longer they are stuck in limbo. Instead of requiring the customer to stay on the phone, businesses can use technology that automatically calls a customer back when it’s their place in line. Software solutions such as Fonolo can easily help businesses implement this option. Your business can make hold times even more flexible for callers by allowing them to schedule a time to receive a call back. For example, if the customer will reach the front of the hold line in approximately 20 minutes, but that time isn’t convenient for them, they can schedule a time for the business to call them back in 2 hours instead. “The technology allows for a better experience for the customer, who gets a little bit more control rather than just having to wait on the phone,” Hyken said. Though businesses mean well with the message, “Your call is important to us,” many customers tense up when they hear the oft-repeated hold message. Businesses should think critically about how they can reduce the time customers spend on hold. If hold times must exist, consider creative solutions to alleviate customers’ frustrations. Given the needs and frustrations of customers, some businesses may consider shifting most communication to alternate, text-based channels. Yet, it’s important for businesses to remain openly available over the phone for customers. Customers call businesses for a variety of needs. People called a business in the past six months to fix an issue (24%), ask a question (23%), or make an appointment (19%). Chatbots and texting can effectively answer certain requests, but many customers still require a personalized, human-centric approach. “A cookie cutter approach isn’t always the fix because people believe that their problems are unique,” Strum said. It’s important for businesses to keep their telephone customer service available and efficient. Telephone customer service is still a critical communication channel for most businesses. Businesses should think creatively about how they can improve their customers’ experience on the phone and how they can integrate alternate communication channels to support telephone customer service. Businesses must commit to not only avoiding negative customer service experiences, but creating exceptional ones. After calling businesses, people are nearly as likely to share a positive experience as a negative experience online. Nearly three-quarters of people (74%) are likely to share a positive telephone customer service experience, while 70% are likely to share a negative experience. Some may be surprised by this data, since previous surveys indicate that customers are far more likely to share negative experiences than positive experiences. Yet, Strum said that customers increasingly recognize the importance of good reviews for businesses. "If people really appreciated doing business with someone, I think that they’re pretty likely to go and attempt to share that," Strum said. While businesses should do everything to avoid poor customer service experiences, they should also go a step further and commit to pursuing exceptional telephone customer service, no matter what. While an average experience may not be shared, customers will share both positive and negative ones. Customers keep speed top of mind when they call a business. The largest percentage of customers say they value an efficient resolution to their issue when they call a business, followed by a knowledgeable staff and clear communication. Customers find being kept on hold most annoying when calling a business. Rude service and automated phone menus also ranked highly as frustrating issues. While alternate communication channels such as texting and chatbots can resolve some customers’ issues, it’s still critical for businesses to optimize how they communicate with customers on the phone. Customers are almost as likely to share positive experiences with telephone customer service as they are to share negative ones. Therefore, businesses should focus on not only avoiding negative customer experiences but also pursuing exceptional phone communication. Overall, businesses should continue to improve their telephone customer service to meet every customer’s unique communication needs. We surveyed 501 people in the U.S. who called a business at least three times in the past six months, and who encountered both real employees and automated phone menus during those calls. More than half of respondents are female (55%), while 45% are male. Respondents are divided by age: 19% are 18 to 34, 38% are 35 to 54, and 44% are 55 and older. The survey included respondents from the Midwest (21%), Northeast (14%), South (38%), and West (26%). The remaining 3% of respondents’ locations are unknown.